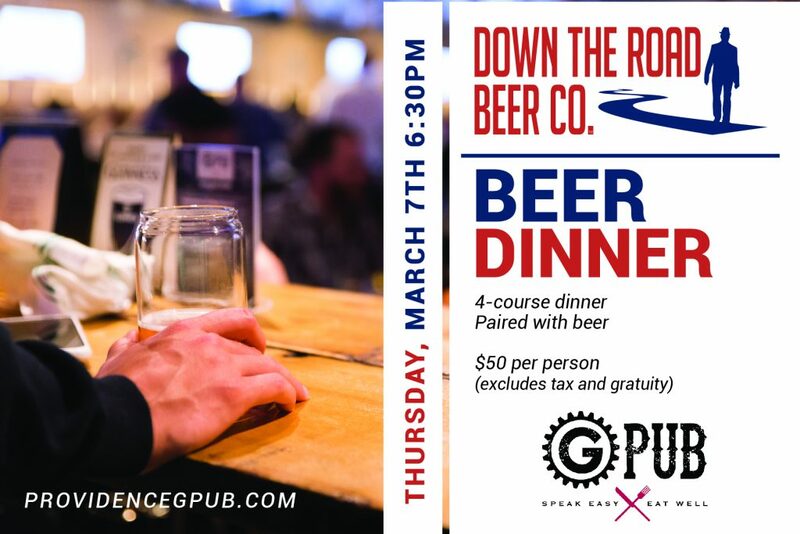 On Thursday, March 7th, join Providence GPub for a four-course dinner with expert beer pairings from Down The Road Beer Co. The evening promises to astound the taste buds with exclusive dishes from GPub’s kitchen, perfectly complemented with thoughtfully chosen craft beers from one of the region’s most celebrated breweries. Down The Road Beer Co., based in Everett MA, features beers that are rooted in tradition, yet adaptable to the inevitable change of the future. Their beers are familiar, yet unique. Comforting, yet exciting. They draw from the long narrative of brewing and storytelling. IPA, and a unique version of the classic Chicken and Waffle dish paired with Folktour, a porter made by the brewery. The event begins at 6:30 pm and tickets are $50 per person (excluding tax and gratuity). Complimentary valet parking is available. Tickets can be purchased at providencegpub.com.